Most recently during my precious few moments of free time, The Sweet Spot by Pichet Ong has captured all of my interests. Previous pastry chef to Jean-Georges Vongerichten, Pichet Ong, who has recently opened his dessert bar and shop P*ONG in New York City, uses The Sweet Spot to unravel the mystery of Asian patisserie. From his beginning chapter, “The Sweet Asian Pantry,” Ong clearly and concisely explores an array of Asian ingredients, such as pandan leaves, which are used similarly in Asian pastry as vanilla beans are used in French cuisine, or coconut powder, a substance made by grinding desiccated coconut very finely, which can be used to make coconut milk by adding water. Throughout this section Ong also gives suggestions on how these ingredients can be used, such as using ground cardamom in cookies or candying fresh ginger. The recipe section of the book offers a number of classic Chinese recipes like steamed Pandan Layer Cake (pg 40) or Caramelized Pineapple Turnovers that are traditionally given as gifts during the Chinese New Year (pg 150). The Sweet Spot also seems to be a mixture of Asian cultures; clearly Ong is not only pulling from his Chinese heritage. Recipes like Pistachio Rose Thumbprint Cookies (pg 99) and Rasmalai with Rose Water and Pistachios (pg 177) hail from India, while the Yuzu Mochi on page 195 are a classic Japanese treat. And the Mango Sticky Rice (pg 208) is similar to the one I had recently at my favorite Thai restaurant. While his Asian background is the base of his food, Ong also lets his creativity and surroundings shine through in his work. The close quarters of New York City’s Little Italy and Chinatown inspired the Vietnamese Coffee Tapioca Affogato (pg 266). And in dishes like Ovaltine and Milk Chocolate Kulfi with Caramelized Banana (pg 229) and Spiced Chocolate Pudding with Caramel Crisped Rice Cereal, (pg 159) Ong uses Asian flavors in non traditional ways. Ong also splatters useful tidbits of history and facts throughout the recipes. In the chapter on frozen treats, he discusses the idea that the Chinese were the first culture to collect and store ice as well as serve iced drinks and desserts. He includes facts about his recipes that both Western and Eastern readers may not know, including an interesting passage about Asian puff pastry describing its origins and procedures to make it. The recipes in Ong’s book are clearly written and are for the most part, easy to follow. The Pandan Layer Cake (pg 40), proved fairly simple to make, although I had trouble finding Pandan and ended up using vanilla and green food coloring instead. The layers of the cake turned out though, and the steamed coconut cake was quite tasty. The texture was quite chewy, and slightly less firm than I thought it would be. I am not sure if I should have steamed the layers longer, although I followed the times stated in the recipe, and each layer was fully set up in the pan. The cake was tasty, but a bit too mushy to actually cut into pieces. 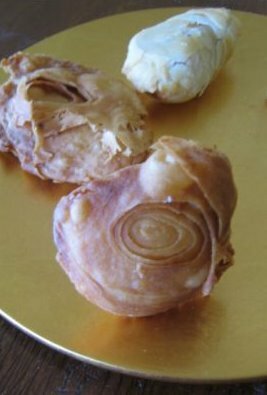 The Chinese Puff Pastry (pg 144) proved a little trickier to pull off; a diagram would have been helpful in describing the intricate folding technique needed to develop the layers in the dough. A simple mixture of flour, oil, and sugar, the trick here is an intricate folding and rolling process which creates layers similar to French puff pastry. 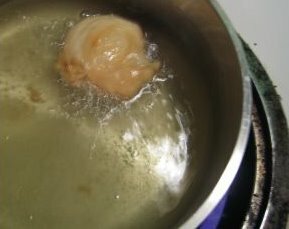 Although Ong suggests the dough is subtable for both baking and frying, my puff really only seemed to work when fried. 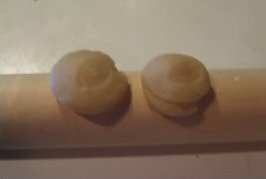 The baked version came out similar to an oyster cracker, while the fried version opened up so that the layers were visible. Once fried, the pretty layers of the puff were worth the effort. The flavor, however, was not as appealing. The oil gives the dough an almost gritty texture, and I certainly prefer the French puff pastry I am accustomed to. Making the dough with a nice olive oil instead of vegetable oil could be an interesting change though, and worth a try. The Mangosteen Sherbet (pg 242) was a simple recipe, but enjoyable. I was surprised to find Ong suggest canned Mangosteen, as I assumed frozen would be a better product, but could only find a canned product to try. The fruit, which I had never tried before, tasted similar to Bosc pears, with a mild, sweet flavor. Anise could be a nice addition to this recipe. All that was necessary for the sherbet base was a simple syrup with a little lemon juice added to the rinsed mangosteens and viola! For the most part though, the recipes in The Sweet Spot are easy to read and easy to follow. The book is full of interesting facts, beautiful pictures, and creative desserts that speak of Ong’s true talent as a pastry chef. For a lesson on the Asian side of patisserie, Pichet Ong’s The Sweet Spot is the way to read.